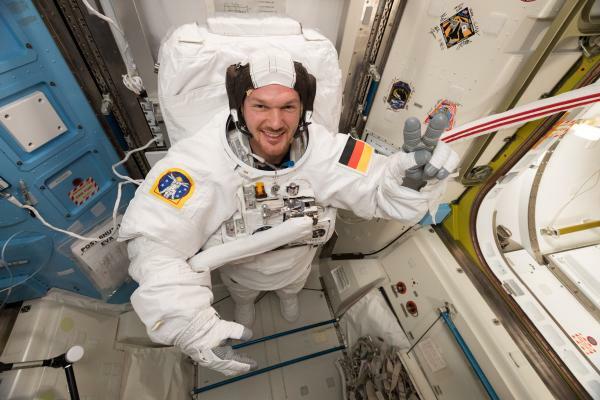 ESA astronaut Alexander Gerst is gearing up to step outside the International Space Station, not once, but twice in September. And the second time he does so, he will be the lead space walker. Alexander’s first spacewalk of the Horizons mission is scheduled for Thursday 20 September and expected to last around 6.5 hours. During this time, he will work closely with NASA crew mate Drew Feustel, from whom he will take over command of the International Space Station on 3 October. His second spacewalk – also expected to last around 6.5 hours – will take place less than one week later on 26 September. It is during this spacewalk, with NASA astronaut Ricky Arnold that he will fulfil the lead role, known as EV1. The main purpose of these spacewalks is to replace batteries on the Space Station’s Port 4 truss structure power channels. The replacement batteries will make their way to the Space Station aboard the Japan Aerospace Exploration Agency’s (JAXA) Kounotori HTV resupply vehicle. This crew-less cargo vehicle is scheduled for launch from the Tanegashima Space Center in Kagoshima Prefecture on 11 September, carrying around 6200 kg of food, clothing and other essential items to help support life up in space. Each of the spacewalks will be tightly scheduled and supported by astronauts inside the Space Station as well as crew down on the ground. Both will be available to view via NASA TV, with further details and more information about additional spacewalk tasks provided closer to the time. and stay tuned to the blog for all the latest updates from the Horizons mission. Extravehicular Activity (EVA) Preparations: Today the crew continued gathering and configuring various tools and tethers needed for the upcoming H-II Transfer Vehicle (HTV)-7 Battery R&R EVAs in September. In addition to configuring three 85-foot Safety Tether Packs for EVA use, they also began building the Crewlock bags that will be used during the first EVA scheduled for 20 September. Extravehicular Mobility Unit (EMU) Loop Scrub: Earlier today, the crew performed the 90-day maintenance loop scrub and iodination task on EMUs 3006, 3008, and the Liquid Cooling and Ventilation Garments (LCVGs). This was the first use of the newly designed Airlock Cooling Loop Recovery (ALCLR) hardware. The ALCLR system is a suite of water processing hardware that is used to service the transport water loops in the EMU and airlock water systems. ALCLR removes ionic, organic, and particulate contamination and provides long-term microbial control through injection of activated iodine. Extravehicular Activity (EVA) Preparations: Today the crew completed initial configuration of the tools and hardware that will be used during the upcoming H-II Transfer Vehicle (HTV)-7 Battery R&R EVAs in September. Spread across several days, today’s activity completed configuration of Safety Tether Packs and EVA Wire Tie Caddies as well as ensure all EVA tools are in the proper config. The first EVA in the pair is scheduled for 20 September while the second planned EVA is scheduled on 26 September. Astronauts on the International Space Station will conduct spacewalks Sept. 23 and 29 to continue upgrades to the orbiting laboratory’s power system. Experts from NASA will preview this work in a briefing at 2 p.m. EDT Tuesday, Sept. 18, at NASA’s Johnson Space Center in Houston. Live coverage of the briefing and spacewalks will air on NASA Television and the agency’s website. Media wishing to participate in the briefing in person must request credentials from the Johnson newsroom no later than 4 p.m. Monday, Sept. 17. Media interested in participating by phone must contact the newsroom by 1:45 p.m. Sept. 18. The equipment to be installed will be delivered on a Japanese H-II Transfer Vehicle cargo craft. The installation work will begin on Earth, when ground controllers use the station’s robotic arm to replace old nickel-hydrogen batteries on the port truss of the complex with six new lithium-ion batteries. Station Commander Drew Feustel of NASA and Flight Engineer Alexander Gerst of ESA (European Space Agency) will venture outside the Quest airlock Sunday, Sept. 23 to install the adapter plates for the new batteries, completing the upgrades to two station power channels. With this spacewalk, the 10th of his career, Feustel will tie former astronaut Michael Lopez-Alegria for most spacewalks by a U.S. astronaut, and is expected to surpass him for overall spacewalking time to become the all-time leading U.S. spacewalker and second overall in spaceflight history. It will be Gerst’s second spacewalk. Six days later, on Saturday, Sept. 29, NASA Flight Engineer Ricky Arnold will join Gerst to complete the power system refurbishment on the port truss. It will be Arnold’s sixth spacewalk. Coverage of the spacewalks will begin on NASA TV and the agency’s website at 6:30 a.m., with both spacewalks scheduled to begin around 8 a.m. and last about six-and-a-half hours. These spacewalks will be the 213th and 214th in support of station assembly, maintenance and upgrades; and the eighth and ninth outside the station this year. Extravehicular Mobility Unit (EMU) Loop Scrub, Iodination, Flow Test, and H20 Recharge: In preparation for the upcoming H-II Transfer Vehicle (HTV)-7 Battery R&R ExtraVehicular Activities (EVAs), the crew performed EMU water loop scrubs and tested water samples for conductivity. An EMU flow test was also performed on EMU 3003 and FE-5’s Liquid Cooling and Ventilation Garment (LCVG) was filled using EMU 3004. EMU Loop Scrubs are required preventive maintenance needed to remove any chemical and biological contaminants from the EMU Transport Loop. Extravehicular Activity (EVA) Preparation: Today the USOS Crew reviewed the EVA Briefing Package for the upcoming HTV-7 Battery R&R EVAs. This comprehensive review included a Tool Configuration Summary, detailed EVA Procedures and Timelines, Get Ahead Procedures, and Notes, Cautions and Warnings associated with the aforementioned tasks. Once complete with their self-study, the crew had a conference with EVA specialists to answer their questions and address any concerns. On-Orbit Fit Verification (OFV): Today the crew completed an OFV in support of the upcoming H-II Transfer Vehicle (HTV)-7 Battery Remove and Replace (R&R) ExtraVehicular Activity (EVAs). During the OFV, the crew took body measurements and resized their Extravehicular Mobility Unit (EMU) to ensure proper fit. Each EMU contains exchangeable components allowing each astronaut to adjust EMU fit to their individual preference. ExtraVehicular Activity (EVA) Preparations: In preparation for the upcoming H-II Transfer Vehicle (HTV)-7 Battery Remove and Replace (R&R) EVAs, the crew completed a plethora of Road-To-EVA task. In addition to initiating a Metal Oxide (MetOx) Canister regeneration cycle, they prepared the Equipment Lock for EVA and completed a checkout of the Simplified Aids for EVA Rescue (SAFERs). 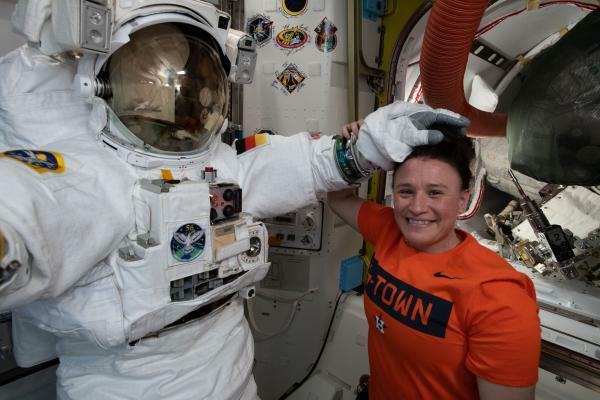 Experts from NASA will preview two upcoming spacewalks outside the International Space Station to continue upgrades to the orbiting laboratory’s power system in a briefing at 2 p.m. EDT Thursday, Sept. 27, at the agency’s Johnson Space Center in Houston. The briefing date changed because of the delayed launch of a Japanese cargo spacecraft to the space station. Live coverage of the briefing will air on NASA Television and the agency’s website. Media wishing to participate in the briefing in person must request credentials from the Johnson newsroom no later than 4 p.m. Wednesday, Sept. 26. Media interested in participating by phone must contact the newsroom by 1:45 p.m. Sept. 27. The equipment to be installed will be delivered on a Japanese H-II Transfer Vehicle cargo craft, which now is targeted for launch at 2:15 p.m. EDT Friday, Sept. 21. Live NASA Television coverage begins at 1:45 p.m. The delivered equipment installation work on the space station actually will begin on Earth, when ground controllers use the station’s robotic arm to replace old nickel-hydrogen batteries on the port truss of the complex with six new lithium-ion batteries. 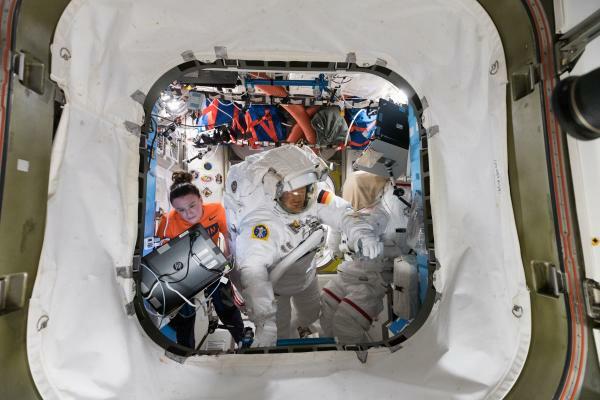 Station Commander Drew Feustel of NASA and Flight Engineer Alexander Gerst of ESA (European Space Agency) will venture outside the Quest airlock Sunday, Sept. 30, to install the adapter plates for the new batteries, completing the upgrades to two station power channels. With this spacewalk - the 10th of his career - Feustel will tie former astronaut Michael Lopez-Alegria for most spacewalks by a U.S. astronaut, and is expected to surpass him for overall spacewalking time to become the all-time leading U.S. spacewalker and second overall in spaceflight history. It will be Gerst’s second spacewalk. The exact date of the second spacewalk is under review, but it will take place during the next station crew rotation, Expedition 57. Astronauts will use that spacewalk to complete the power system refurbishment on the port truss. NASA will provide coverage of the spacewalks, each expected to last about six-and-a-half hours, on NASA TV and the agency’s website. NASA TV coverage on Sept. 30 will begin at 7 a.m. with the spacewalk expected to begin at approximately 8:40 a.m. These spacewalks will be the 213th and 214th in support of station assembly, maintenance and upgrades; and the eighth and ninth outside the station this year. ESA astronaut Alexander Gerst’s two September spacewalks will be rescheduled due to the postponed launch of Japan’s HTV-7 resupply vehicle. This spacecraft brings new lithium ion batteries to the International Space Station, which Alexander will install on the Station’s truss structure with a NASA crew mate. It will be Alexander’s first spacewalk of the Horizons mission. The delay in the HTV-7’s launch follows bad weather at the Tanegashima Space Center launch site in Japan alongside investigation of the vehicle’s propulsion system. It is now re-scheduled for launch but follow the Japan’s space agency JAXA for latest news. New batteries on board HTV-7 replace older nickel cadmium batteries that store power generated by the Station’s solar panels. Their replacement is part of an ongoing programme to upgrade all external batteries and Japan’s HTV vehicle is the only one large enough to carry them up to the Station. Four of the six new batteries will be installed via robotic arm. The remaining two will be installed during Alexander’s first spacewalk, and a second spacewalk likely to be scheduled during the second half of Alexander’s mission. Alongside the batteries, HTV-7 also carries ESA’s next-generation life-support system known as the Advanced Closed Loop System. This system recycles carbon dioxide, turning it into oxygen and will save around 400 litres of water being transported to the Space Station per year. Alexander is expected to install the Advanced Closed Loop System inside the US Destiny laboratory module in November. 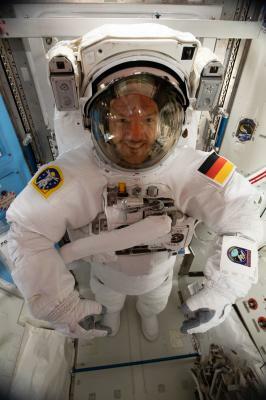 This image of ESA astronaut Alexander Gerst testing the space suit for his rescheduled spacewalks was shared on his social media channels on 18 September 2018. Alexander said "Today getting our suits ready for the upcoming space walks"
Follow Alexander and the Horizons mission on social media on his website and on his blog. Getting our suits ready for the upcoming space walks / Heute passen wir unsere Raumanzüge für die kommenden Ausstiege in den freien Weltraum an. 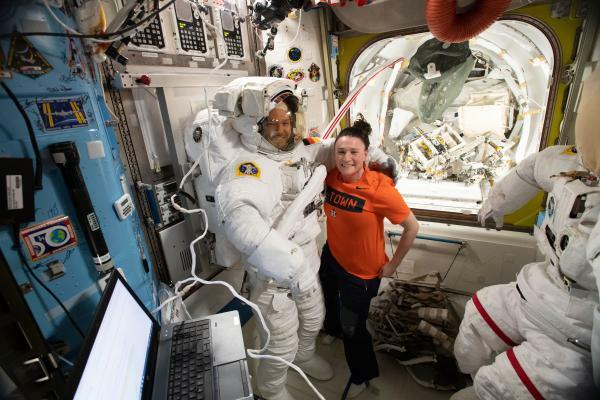 ExtraVehicular Activity (EVA) Virtual Reality (VR) Trainer Troubleshooting: During use of the new VR Trainer hardware brought to ISS earlier this year, the crew had issues connecting to an Oculus VR headset and had to use the spare unit. Today the crew did troubleshooting on the unit and gathered data for analysis by ground specialists. Once they determine which component in the system has failed, additional hardware will be manifested on resupply vehicles later this year to restore the system and provide redundant VR trainers. Astronauts on the International Space Station will conduct spacewalks Friday, Oct. 19, and Thursday, Oct. 25, to continue power system upgrades, and experts will preview the work during a news conference Tuesday, Oct. 16, at NASA’s Johnson Space Center in Houston. Media wishing to attend the briefing at 2 p.m. EDT must request credentials from the Johnson newsroom no later than 4 p.m. Monday, Oct. 15. Media interested in participating by phone must contact the newsroom by 1:45 p.m. Oct. 16. NASA TV coverage of both spacewalks will begin at 6:30 a.m., and the spacewalks will begin around 8 a.m. Each is planned to take about six-and-a-half hours to complete. The spacewalks will focus on replacing older technology batteries with six new lithium-ion batteries. The new batteries, and accompanying adapter plates, arrived at the station on the Japanese H-II Transport Vehicle-7 (HTV-7) cargo craft Sept. 27. Ground controllers will set the stage for the spacewalks by remotely swapping out old nickel-hydrogen batteries on the station’s port truss, or “backbone,” using the station’s robotic arm. 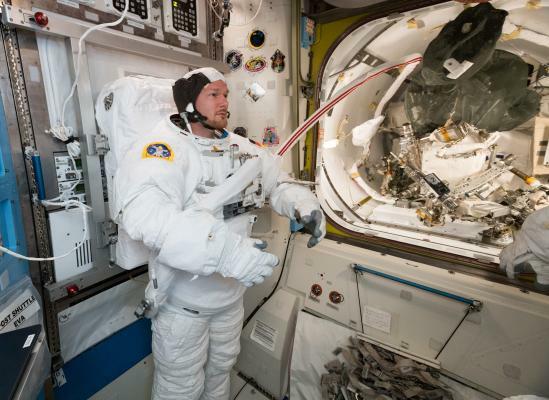 On Oct. 19, space station Commander Alexander Gerst of ESA (European Space Agency) and Flight Engineer Nick Hague of NASA will venture outside the Quest airlock for the first excursion to upgrade two power channels. 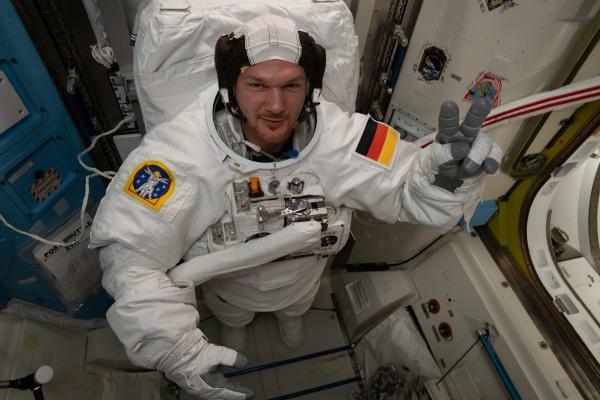 This will be the second spacewalk for Gerst and the first for Hague. Six days later, Gerst and Hague again will team up to complete the power system upgrades. The spacewalks will be the 213th and 214th in support of station assembly, maintenance and upgrades and the eighth and ninth this year. Since Nick Hague was supposed to be one of the EV astronauts, what happens now? Note that HTV-7 was supposed to be unberthed in mid-November. Could Prokopyev be EV-2? If Auñón-Chancellor is EV-2 can Prokopyev operate the SSRMS? Interesting questions for the ISS managers. Or, later after HTV departure on schedule, could the EP with old batteries be disposed of (released/pushed retrograde) without risk to the station? Or ad hoc strapped to another visiting vehicle's external cargo carrier? Cargo Dragon is coming soon, could put them into the trunk that opens up after delivering cargo, but how to mount? Or keep it strapped to the ISS for a year somewhere until the next HTV comes up and can take the trash out or you figure out what to do with it. But I don't think even NASA has that totally figured out ~24 hours after their plans came back down to Kazakhstan. Can HTV-7's departure be delayed until shortly before arrival of Dragon SpX-16, which would berth at the same port? This would give another 2 weeks? to complete the battery change-out EVAs and the battery swaps with the SSRMS. Can HTV-7 unberth and release from ISS, but formation-fly with ISS outside the KOS for an extended period of time? Then, perform a brief re-berthing when the removed, old NiCd batteries are ready for external stowage on HTV, then unberth for the HTV de-orbit? This would have to be when a USOS VV port is available.